This past week we have been experiencing a November heat wave! With temperatures reaching 70 degrees (our average high is 56 degrees in November), we are experiencing the amazing combination of peak fall color and stunning fall blooms. The lack of frost has allowed us to enjoy some extended time with our favorite fall-blooming flowers. 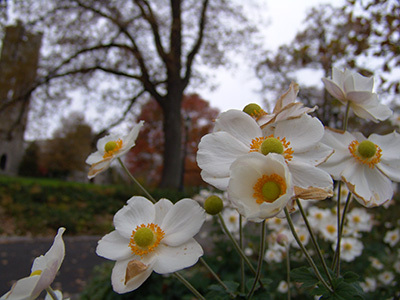 Unlike spring anemone, Anemone x hybrida ‘Honorine Jobert’ blooms in the fall on long graceful upright stems. The multitude of pure white flowers is dramatic against the fall color on the Magill Walk. During the growing season, the solid clumps of dark green leaves look attractive en masse. Doing well in full to partial sun, the flowers make great cut flowers. 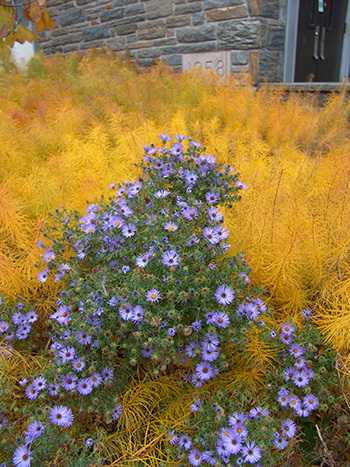 Another fall favorite making a statement with its golden fall companion, Amsonia hubrichtii ,is Symphyotrichum oblongifolius ‘October Skies’. The hundreds of daisy-like flowers create purple ribbons through the golden Amsonia. Like most asters, S. ‘October Skies’ attracts butterflies and makes a great cut flower. This low-growing bushy perennial grows easily in full sun and average to dry soil. Typically blooming from September to October, this year the season has been stretched well into November. Ironically named Rosa ‘Summer Memories’, this rose offers flushes of cream blooms throughout the season. Summer memories can be invoked while in the Dean Bond Rose Gardens this late November with medium to large clusters of old-fashioned blooms. An arching, bushy, upright shrub rose, R. ‘Summer Memories’ has received many rose awards including Adelaide Silver Medal, Gerald Meylan Award 2010, Rome Gold Medal 2001, Potsdam Gold Medal 2001, and St. Albans Presidents Trophy. While half of the Dean Bond Rose Garden is under renovation, the completed half has a delightful array of perennials inter-mixed with roses. 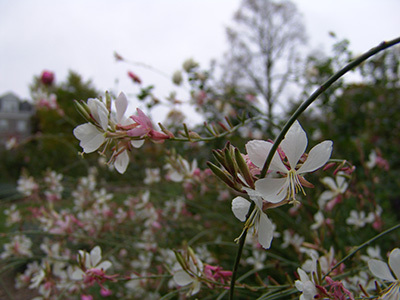 Still catching your eye among the re-blooming roses is Gaura lindheimeri ‘Whirling Butterflies’. 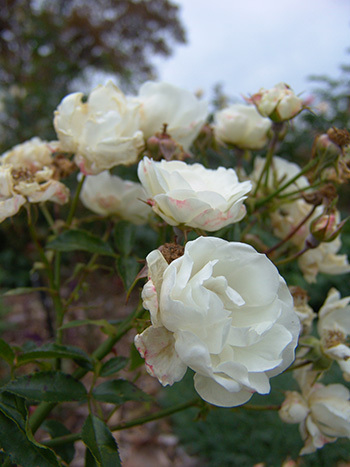 Valued for its long display of flowers (summer into fall), the November heat wave has allowed the loose sprays of white flowers tinged with pale pink to continue their showcase. The butterfly-like flowers often sway gently in the wind on their arching, red, strap-like panicles. This compact, clump-forming perennial can tolerate heat, humidity, and drought. Boasting of deer resistance, it prefers full sun and well-drained soils. 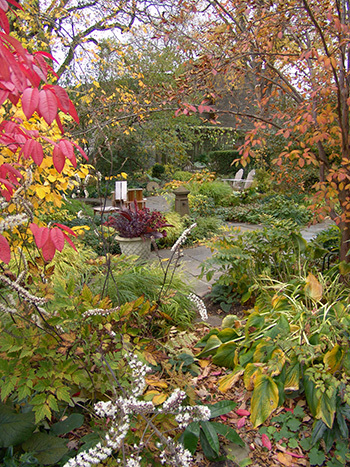 We invite you to come see all our fall bloomers before Jack Frost finally makes an appearance. Beautiful photography – and amazing views for this late in the season! Thank you, Jody. The campus is just begging to have its picture taken this season. Beautiful shots, Becky. However, just five minutes ago I looked out back and there is snow, and it is sticking already. Some plants covered. Alas, summer is over. Thank you, Diane. It has been a beautiful fall. I got this post up just in time to beat our first snow this season. Although there was not much damage on plants this morning.